Posted on June 1, 2014	by Rev. Rosemary Hyde, Ph.D. This morning, Nancy and I decided to embark on an adventure in search of gluten-free treats. France is way behind the US in terms of commercial baking for people with food allergies. After a certain time, being a food outcast begins to become burdensome. Especially, the experience at the Lebanese cafe housed in the Arab Institute a couple of days ago had whetted my appetite for a less frustrating food situation. At the Lebanese cafe, practically every item on the menu had some involvement with dairy or gluten. I ordered chicken Kabob, which seemed the best possibility. It came enclosed in a pita that had stuck tenaciously to all sides of the meat. Around the pitachicken were arrayed dollops of yogurt, and a large mass of tabouli, made with parsley and Couscous (wheat). Fortunately a small scoop of hummus also sat amid the tabouli and yogurt so I wouldn’t have to eat the chicken totally dry. I was very hungry, as it was already 4 pm without any opportunity to eat lunch. But I found myself, using my fingernails, painstakingly peeling the tiny scraps of pita off the whole surface of each piece of chicken so that I could eat the meat, while I also tried to keep the chicken from contacting the yogurt and the tabouli. It felt very discouraging to be trying to eat crumbs from among this plenitude of food that would make me ill.
As a result, I was ready to embark on a long bus ride, with a transfer in an unfamiliar place, to get to the 10th arrondissement where, somewhere, on a small street, was located the one reputedly gluten free bakery and restaurant in Paris. Their website told us they were serving brunch from 12 to 3 pm. We left the house around 12:30, figuring we’d have plenty of time to get there by 2, and we’d be able to enjoy eating their brunch and feeling liberated. We had to take bus lines we didn’t know from stops we hadn’t encountered before — an adventure. It was about twice as far as we had expected to the stop for the first bus — about 10 blocks from our apartment. We finally found the right street. 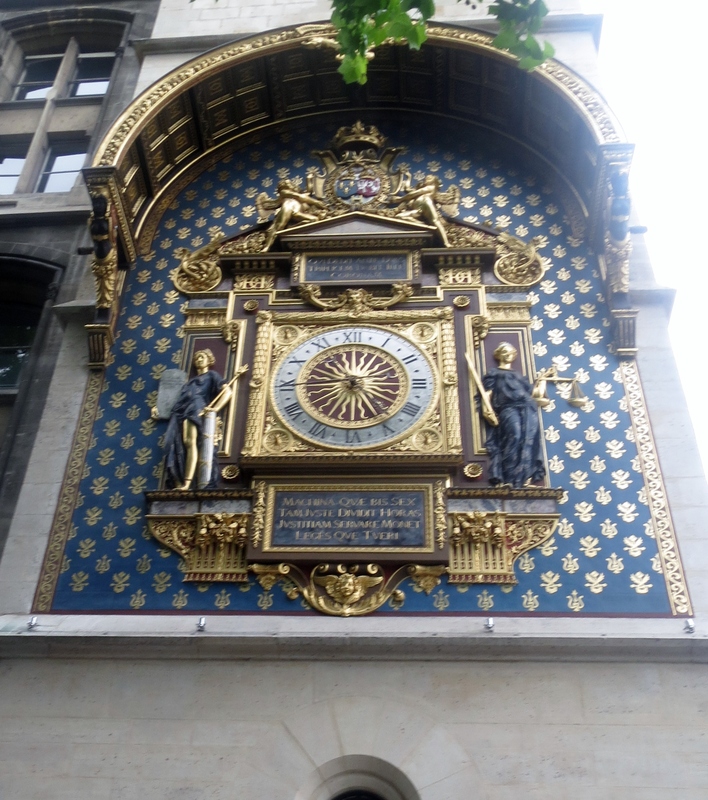 The bus ride was long — about a half hour — to one of the train stations on the other bank of the Seine. The train station where we were to change buses was a huge correspondence point, with a good dozen bus lines crisscrossing in a 3-4 square block grid with bus stops lined up on each street. Each line has its own stop, separate from the others. We were wandering around, looking at all the streets and all the stops, till we found the right one, and then we felt fortunate that a bus came along in less than 10 minutes. That’s where the adventure got interesting. As we got closer and closer to the stop where we were to get off, it was clear we were in a less and less prosperous area of Paris. Large, identical apartment blocs lined up monotonously — projects. 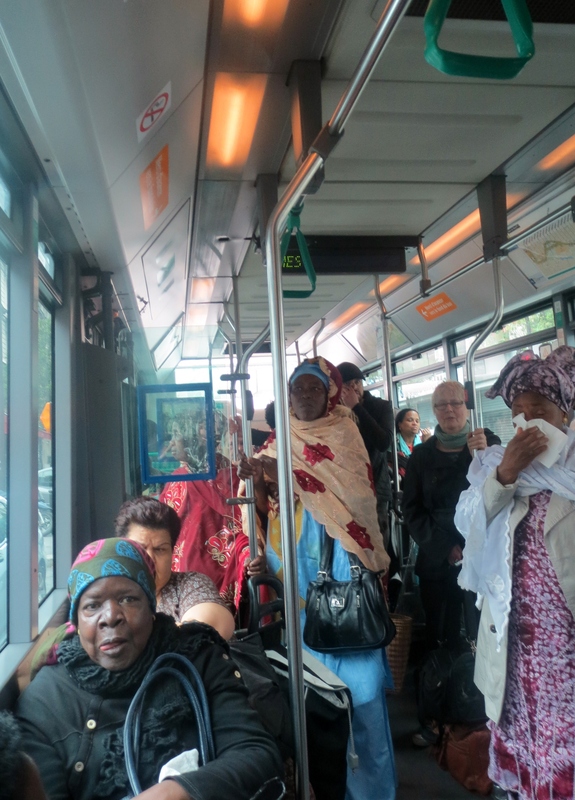 The people on the bus and on the streets were clearly not tourists, but Parisians from less prosperous groups. In addition, we saw many obviously recent immigrants from Africa, with their brightly colored native costumes. Graffiti covered every possible surface. Many blocks were empty of inhabited buildings. The bus stops got further and further apart. In the more prosperous arrondissements in the center, the buses stop every couple of blocks. Further out, in this less prosperous area, we went 15 or more blocks between stops. We crossed the Canal St. Martin, which has looked charming in photos I’ve seen of it. In contrast to the photos, however, the buildings were empty and run down, and every possible surface was covered with graffiti. 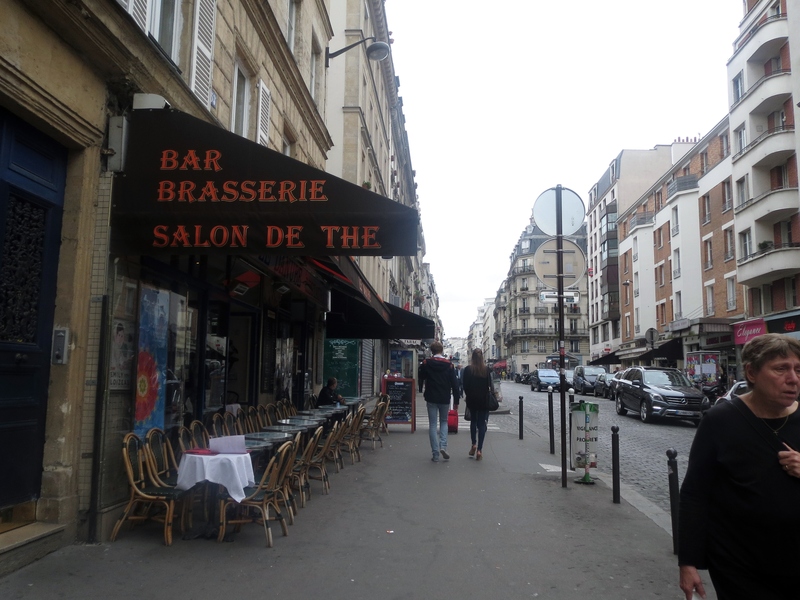 Fortunately, just before our stop, we began to see some inhabited commercial areas, with a few people walking on the sidewalks, and a couple of cafes open, if rather empty. So when we got off the bus at our stop, we could ask the proprietor of an open cafe where the street was that we were seeking. The gluten free place was allegedly on rue Bichat, a small, three block long street lined with empty buildings and buildings being worked on. So few businesses were open that I couldn’t imagine the bakery being anywhere around. But finally, we found it, at the end of the street — and it was open and very full of people. It had taken us about two and a half hours to make the trek from the Latin Quarter to this area on the other side of Canal St. Martin, and by the time we got there, they had stopped serving brunch. We were able to get a coffee and a gluten free pastry, however. And the pastry was delicious, as we had hoped. We picked up a couple more pastry items to take back home with us, and left to make the return trip. Pondering how long it had taken us to get there, we thought that the Metro might be faster than the bus. Maybe it was, slightly. 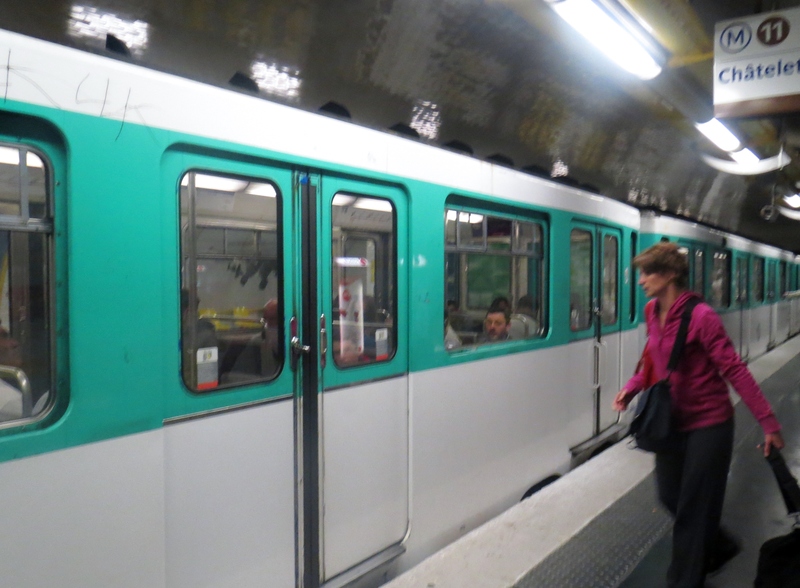 The closest Metro line did go back to the center of Paris, “Chatelet,” near Notre Dame. Chatelet is another huge correspondence point for both metro lines and buses — close to a dozen Metro lines and over a dozen buses cross paths in that general area. 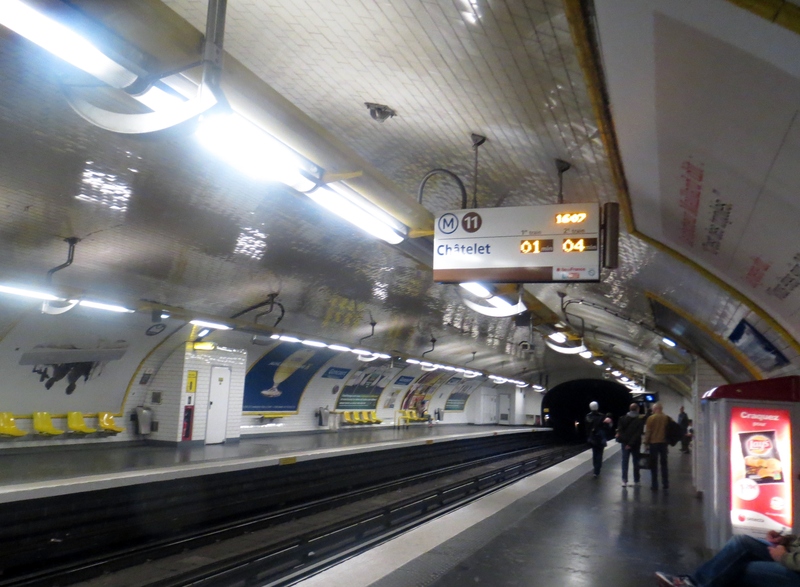 We got back to Chatelet fairly quickly — maybe about 15 minutes after we went underground. But the underground Chatelet station was like a maze. We walked and walked, and the “exit” signs were crossed out because different passages were being worked on. Finally, we decided we had to head toward a crossed out exit — otherwise it seemed like we might be stuck down there forever, making me think of a song from a long time ago, called “Charlie on the MTA” — about a fellow who went into the Boston underground and never found his way back out. And indeed, finally, we found an exit that was open, although all the signs said it wasn’t. We came up in a place we hadn’t been before: Boulevard Victoria and Boulevard de Sebastopol. Hmmmm…… we were totally disoriented. The Seine and Ile de la Cite were someplace within four or five blocks, but in which direction? It was impossible to tell. We found a bus stop with a map and studied the map. One way streets were indicated with little arrows on the map, and we saw that if we went down Boulevard de Sebastopol against the flow of traffic, that was likely to be the right direction. Then we saw the familiar 21 bus, its destination sign indicating it was going in the opposite direction of home. So we knew we were going in the right direction, and would find a bus stop for the bus going the other way. 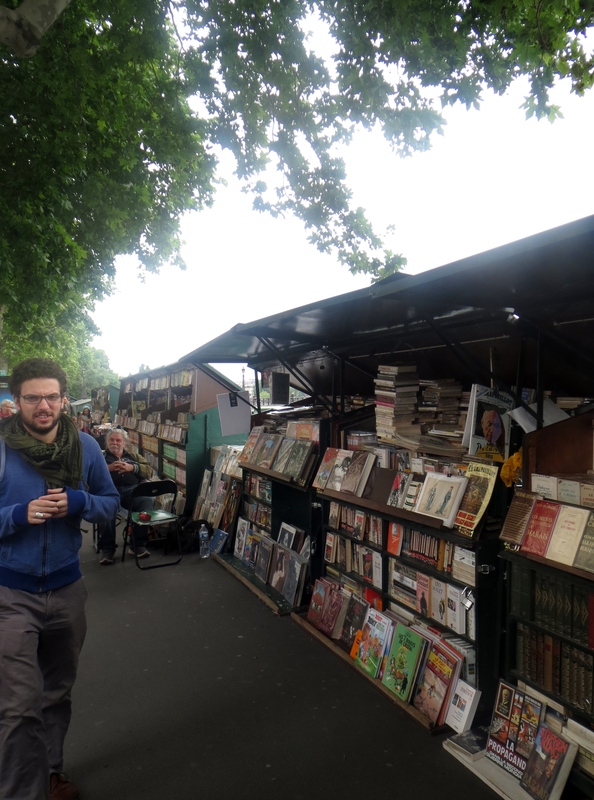 And then,there appeared the bookstalls that line the quais of the Seine, and we could see the towers of Notre Dame and the Sainte Chapelle, and the great medieval clock on the facade of the blocks long fortress/ prison of the Conciergerie. So then we could find a bus stop for the ride back to our apartment, where we arrived at about quarter to 6, about 5 hours after leaving to go have lunch and finding instead a pastry and a coffee across Paris from where we are staying. But it was an interesting adventure — a foray into decidedly untouristic streets of Paris projects and deserted factories. We also experienced a challenge to our urban orienteering abilities. And we discovered the bleeding edges of an area just beginning to undergo gentrification, with the displacement and demolition that process involves. Neighbors in the area of the gluten-free bakery are indignant that Monoprix (the Walmart-like French discount store) had torn down buildings on rue Bichat that had sheltered at least 15 small businesses and crafts sudios, planning to replace them with a mega-store (by Parisian standards) that would further destroy independent business opportunities for ordinary people. The neighborhood where the gluten free bakery had opened its doors to a clientele a majority of whom clearly didn’t live near there, is filled with Haussmannian 6 story apartment buildings that are similar to those closer to the city center, although in neglected condition. However, many of them are surrounded by scaffolding, and by peeking behind the barriers, it’s clear that many of these potentially beautiful buildings are in the process of being rehabilitated. It’s probably possible around there to get an apartment fairly inexpensively (knowing it has to be gutted and rehabbed). Finally, once again, the experience of missing out on lunch but having no problem finding candy or other sweet treats made me wonder once again if perhaps Marie Antoinette’s “Let them eat cake” might not have been quite as outlandish in a Parisian setting as it always seemed from the US. Sometimes it really is easier here to end up eating sugary delicacies than to find basic, nourishing food, and this wasn’t the first time during this trip that I’ve experienced that apparent contradiction. 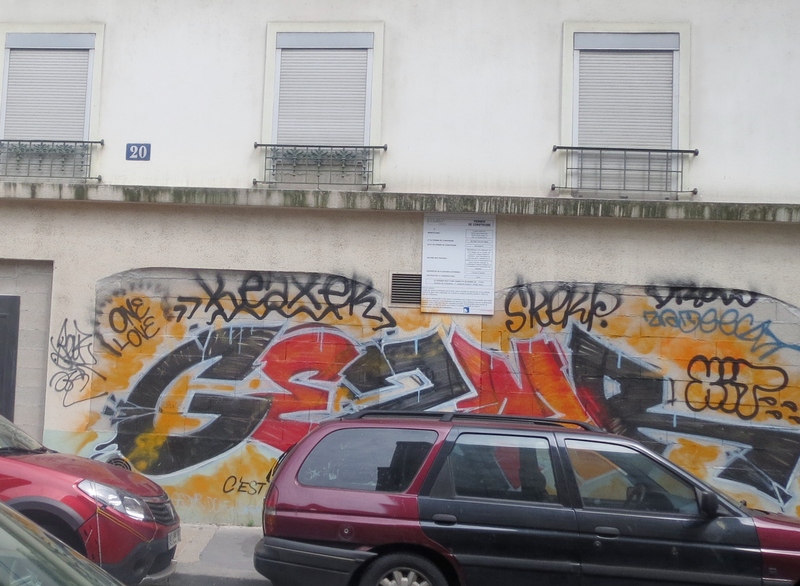 This entry was posted in Uncategorized and tagged gentrification, gluten-free, grafitti, Paris, tenth arrondissement. Bookmark the permalink.